Today, the Sesquicentennial of American Independence Commemorative Silver Half Dollar Coin remembers privateering of 1776 and later. October 12th, of this year (1776), an armed British brig, the name of which has been lost, fitted out by the government of the Island of Jamaica, made an attempt on a small convoy of American vessels, off Cape Nicola Mole, in the West Indies, then in charge of the privateer Ranger, 18 guns, Captain Hudson. Perceiving the aim of the enemy, Captain Hudson ran under her stern, and gave her a severe raking fire. The action thus commenced, lasted nearly two hours, when the Ranger boarded, and carried the brig, hand to hand. The English vessel, in this affair, reported thirteen men killed and wounded by the raking broadside of the Ranger alone. In the whole, she had between thirty and forty of her people injured. On her return from this cruise, the Ranger was purchased for the navy. Privateers differed from pirates even though their methods appeared much the same. First, privateers obtained approvals and carried signed documents explaining their legality. In the most limited terms, a privateer was a private armed vessel carrying no cargo, devoted exclusively to warlike use, and operating under a commission obtained from the government. Some of these commissions were called Letters of Marque, and were issued to armed cargo-carrying vessels authorizing them to engage enemy shipping during the course of their commercial voyages. By 1812, Letters of Marque and Privateer Commissions were essentially the same document, and it is certainly not grossly incorrect to refer to all such vessels as privateers. Letters of Marque were licenses granted by a monarch or government to privately-owned vessels, enabling them under certain conditions to war against the shipping of an enemy nation. The word marque, from the French, was used in this sense to mean a pledge to seize or capture. Vessels carrying these documents were popularly known as privateers. There were nearly 800 American privateers commissioned during the Revolutionary War, 365 during the period of the undeclared war with France, ca. 1798-1800, and more than 500 sailed against the British during the War of 1812. Application and issuance procedures varied from one period to another. During the American Revolution the Continental Congress adopted a printed form with blank spaces for the name of the vessel, owners and master, and figures for tonnage, guns and crew. These blank commissions, signed by the President of Congress, were sent out to the United Colonies, who assumed primary responsibility for the regulation and conduct of their own privateer fleets. By 1812 a ship owner applied in writing to the Collector, or in some cases directly to the State Department. If approved, he would then sign a bond, usually for a sum ranging between $5,000 and $10,000 (depending upon the size of his vessel or crew) to insure his ship’s compliance with the conditions of the Letter of Marque or Privateer Commission. The document itself, containing the signatures of the President and the Secretary of State, was then issued to the ship owner through the Customs Service, and remained valid until recalled by the government or canceled through a violation of the bond. Letters of Marque were abolished by the Congress of Paris in 1856, and the practice of privateering was considered obsolete by the end of the nineteenth century. Letters of Marque and Privateer’s Commissions can be considered truly unique and valuable items in any maritime collection. 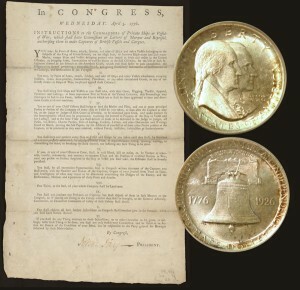 The Sesquicentennial of American Independence Commemorative Silver Half Dollar Coin shows against the instructions from the Continental Congress to Privateers in April 1776.